When’s the last time you considered a 15-year fixed mortgage? It’s not a loan term many people consider because, for whatever reason, so many of us have been conditioned to accept a 30-year as the standard. But we’re HUGE fans of the 15-year loan, and hopefully, by the end of this blog, you will be too. Time and time again, we see home buyers (and ourselves, for that matter) take on 30-year mortgages without even looking at the terms of a 15-year loan. Will my payment be higher on a 15-year? Of course. But it’s often a matter of hundreds of dollars — it’s typically not double, like many people might think (only $557 in our infographic example below). But what we love about the 15-year loan is that you pay down your principal MUCH faster and you end up paying much less interest. 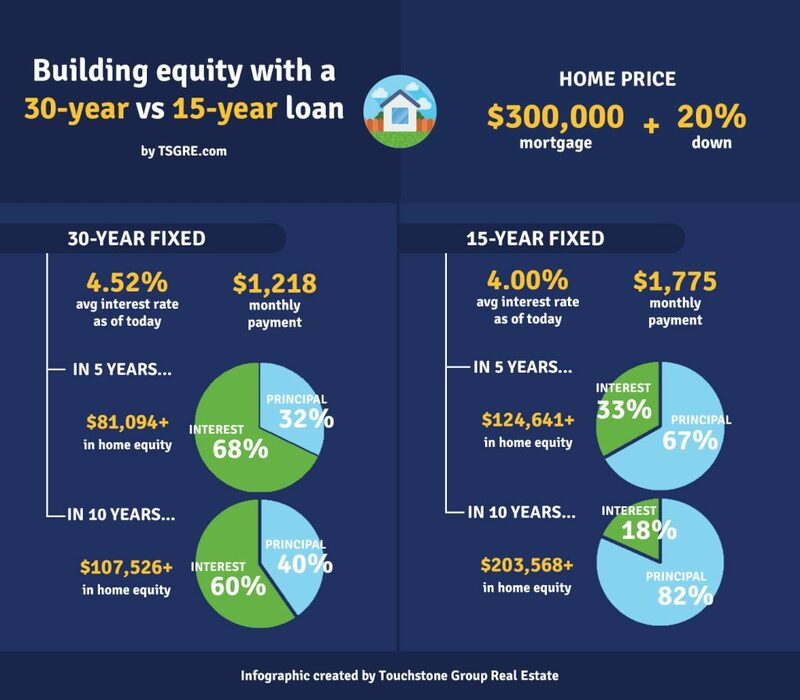 Did you know that the 15-year term can save you hundreds of thousands of dollars AND help you gain equity much more quickly than a traditional 30-year loan? If my payment is higher…won’t I only be able to afford a lot less house? Yes, but it’s still probably a lot more than you think. As brokers, we encourage all of our clients to get preapproved with a reputable lender before they start the home buying process. As they get preapproved, we have our clients ask their lender to show them loan options for 30- and 15-year terms. Based on these figures, we do TWO property searches — one for homes in their 30-year mortgage price range, and one for homes in their 15-year budget. Imagine what you could be doing with all of that saved money or equity! Why do you advocate for this as a broker? Won’t you make less commission if they buy a cheaper house? Yes, a less expensive property means our % commission is smaller. But a home purchase is the biggest investment most people will make in their lifetime. And we prefer that our clients build equity and make money in their real estate purchases. We hope that our clients will let us guide them through their real estate investments, whether it’s their personal home, flip, or cash flow property. Did you find value in this article? Let us help you make smarter real estate purchases in the Chicagoland area today! Call Touchstone Group at 872-225-2008. Follow our blog to stay up to date on the latest insights and trends impacting the Chicagoland real estate market. Get expert perspectives on what's happening at a hyperlocal, local, and national scale. For Sale by Owners (FSBOs): Are you really saving money?